More good news on the neurobics front: Reading books, playing games or engaging in computer activities or crafts like pottery or quilting helps keep the brain young into old age, according to a new report. And while reading was good for the brain, watching too much TV seemed to be bad for it. The findings, to be presented at the American Academy of Neurology’s 61st Annual Meeting in Seattle in late April, add to a growing body of evidence that mental challenges, or “neurobics,” like crossword puzzles and word games help keep memory and thinking sharp. The research, from the Mayo Clinic in Rochester, Minn., involved a random sampling of 1,321 men and women in their 70s and 80s. Among the participants, 197 had mild cognitive impairment, a form of memory loss that sometimes precedes Alzheimer’s disease. The remainder had no memory problems. Both groups filled out questionnaires about their everyday activities during the previous year. They also answered questions about what they engaged in during middle age, when they were in their 50s and 60s. The researchers found that during the later years, those who regularly engaged in mentally-stimulating tasks like reading, crafts and computer activities were 30 to 50 percent less likely to suffer from serious memory loss compared to people who did not do those activities. People who watched television for less than seven hours a day as seniors were 50 percent less likely to develop memory loss than people who watched TV for more than seven hours a day. People who participated in social activities and read magazines during middle age were about 40 percent less likely to develop memory loss than their less social peers or those who read less frequently. The researchers warned that these kinds of studies, which depend on participants’ recall of long past events, can be unreliable. But a growing body of evidence points to the benefits of mental stimulation in helping to ward off memory loss. Such activities may help to preserve and strengthen connections between brain cells in areas of the brain critical for memory. Visit www.ALZinfo.org, the Alzheimer’s Information Site, to learn more about keeping the brain sharp and prevention of Alzheimer’s disease. 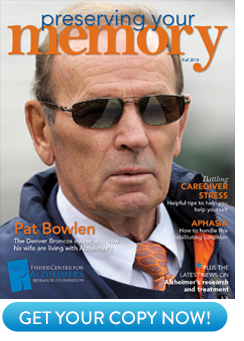 And for thought-provoking games and word puzzles, subscribe free to the Fisher Center’s “Preserving Your Memory” magazine. Yonas E. Geda, Rosebud Roberts, David Knopman, et al: “Cognitive Activities Are Associated With Decreased Risk of Mild Cognitive Impairment: The Mayo Clinic Population-Based Study of Aging.” The American Academy of Neurology.